Authorized cPanel distributor with cPanel experts always available! WHMXtra Ultimate Pro Suite Free! Found a better price? Want to transfer your licenses from another provider but keep your same license pricing? We will match any other competitors external license price, guaranteed! Transfer your licenses from your current provider and we'll setup your licenses to bill on the same day each month! You will have no overlap in billing! Your in control! Easily manage your license(s) through our client area. Here are some of the things you can do! Order and activate new licenses instantly. Schedule license cancellation for end of term. Change license registered IP address. View installed operating system and version. View running environment type and kernel version. 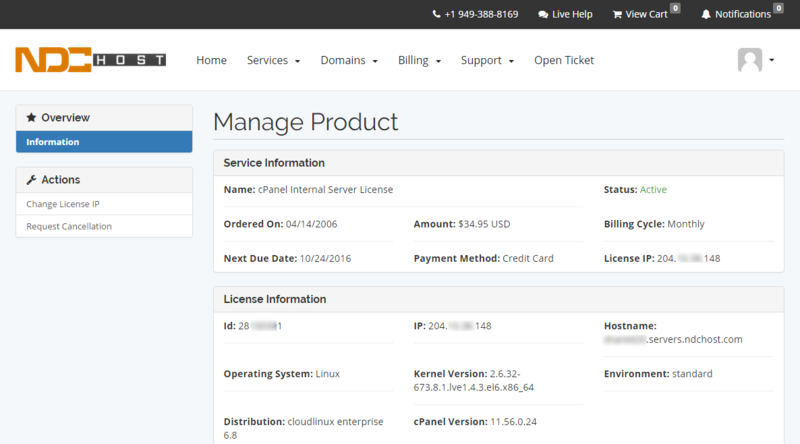 NDCHost has been my Goto Hosting Provider for the past 8 years - From colo to vps to dedicated and all of our cPanel license needs. The team at NDC is amazing! cPlicensing.net is owned and operated by NDCHost, Inc.